At the end of 2013 a number of fine small businesses at Flatbush Avenue & Park Place lost their leases & were forced to vacate their premises. These included the venerable Dominican restaurant El Gran Castillo de Jagua (almost forty years at the corner of Flatbush), Benoit barbershop (forty-six years), and Little Miss Muffin 'n' Her Stuffin' (twenty years), where you could buy just about the best patties around. 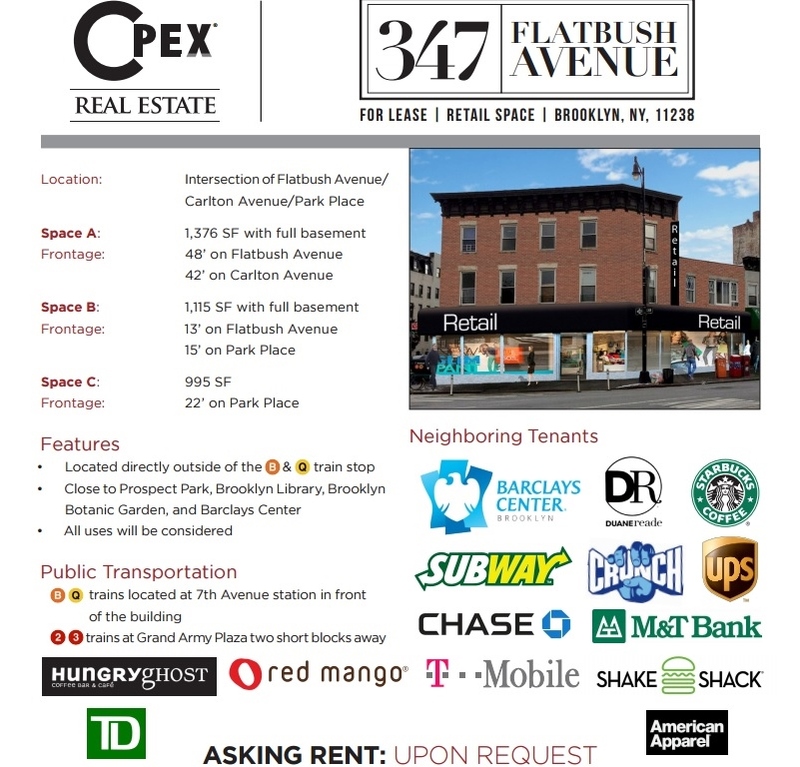 Happily, all three businesses managed to find new premises - El Gran Castillo just around the corner on Flatbush, next to Charlene's bar, Benoit to Rogers Ave. in Prospect Lefferts, and Little Miss Muffin to Washington Avenue in Prospect Heights. Still, the three new locations are development hot zones themselves. The old El Gran Castillo store, once the most comforting of places to eat good, hearty, modestly priced food, sits vacant, available for lease at an undisclosed price. 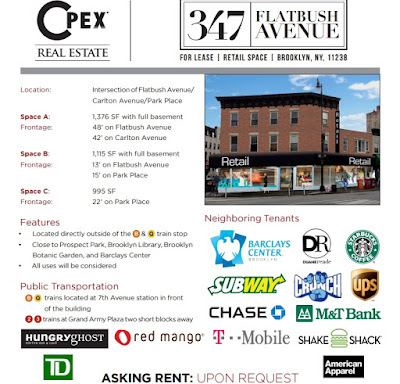 The neighboring tenants listed above do not (of course) include El Gran Castillo de Jagua, which is only five businesses away, and worth a hundred Shake Shacks, Subways, Starbucks & the like. The subject property is a four-story plus basement mixed-use building consisting of ground floor retail and three floor through residential apartments. The retail unit has approximately 6 years remaining on their lease and all three apartments are free-market. Additionally, each of the three apartments are expiring this year or are on month-to-month leases. A good home is hard to find, and even harder to hold onto.